Ultra 180 Dual Arm Track Mount | ICWUSA.com Inc. 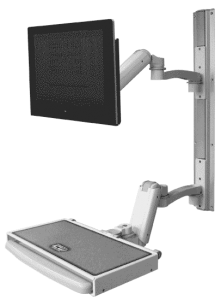 The unique, patented Ultra 180 dual arm configuration provides total flexibility and independent placement of computer and keyboard. Both arms rotate 180° vertically and up to 360° horizontally, providing outstanding freedom of movement for your monitor and keyboard. The arm stows close to the wall, making it the perfect choice for tight spaces. The Ultra 180 dual arm configuration is sturdy and strong–it can support up to 32 lbs (14.5 kg). This unique arm is fully counter-balanced, making it easy to lift and lower your monitor and keyboard. The arm has a sleek appearance and an attractive finish. The Ultra arm is protected by U.S. Patent 9,243,743. *Available in your choice of 14 color options.